Here is a really cool fact to amaze your friends with… Did you know that in the first year’s growth of a child’s foot, it will achieve almost one half of its adult foot size? With that being said is it any wonder that there are quite a few “problems” that arise as the child begins their growth journey to adulthood. Growing pains… Feeling of a deep ache in the legs usually occurring at night. Very non specific. Heel /calcaneal pain, (calcaneal apophysitis). Lasts a few weeks and then subsides. Requires observation. Club foot… Rare birth defect. Flat feet… ( often there is a”fat pad” that is present in the arch making the foot look even flatter that it is). 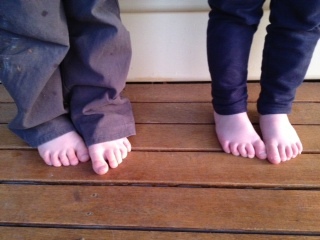 In-toeing… Usually resolves by the age of two years…Very common. Metatarsus Adductus…Feet bend inward from the middle of the foot. Often resolves at 6-9 months of growth. Toe walking. Usually a just a habit. Children LOVE to see what is going on above them!!! These are only the more common foot growing problems that parents most often bring their children into the office with. Many of them will resolve on their own and in the more extreme or longer lasting cases may need foot orthotic or stretching exercises to help resolve the anomaly. Proper fitting shoes are very important to facilitate the proper position and support of the growing foot. Hard to keep on the kid’s feet and even harder to keep them tied. It is one of the bains of parenthood in what (sometimes) seems a never ending battle of “you against them”....Just remember to pick your battles and if the child continues to remove the shoes, there may be a poorly fitting shoe or underlying problem that might warrant closer attention. Very often the removing of the shoes is just another phase of growth and learning for the youngsters. Removing and throwing of the shoes is a real attention getter and a fun game for the kids!!! As most things in life (especially with kids…) patience is a virtue.